Though not widely appreciated now, Peter Newell was one of America’s great innovators in larking about with the conventional codex (and he did some remarkably good formal illustrations too). His classic The Hole Book was published in 1908 – a jape that owes much to comic-book art, where a bullet fired off at the start is seen to travel, with attendant mayhem, through the rest of the book. The Slant Book came two years laterand again exploits the idea of a chain reaction set off by one small disaster. Baby Bobby’s pram escapes the grip of his nurse and sets off helter-skelter downhill with the fiendish baby rejoicing in all the calamities he and his unstoppable juggernautlet produce (fire hydrants snapped off, painters knocked off ladders etc). The gimmick though is that the book-block is not rectangular, as is normal, but bound on the slant so that the right hand page of every opening replicates the incline down which Bobby is careering. At least, that’s the plan. But the effect is barely noticeable when the pages are open and the most eye-catching part of the exercise is the somewhat drunken look of the book’s external format when they are closed. 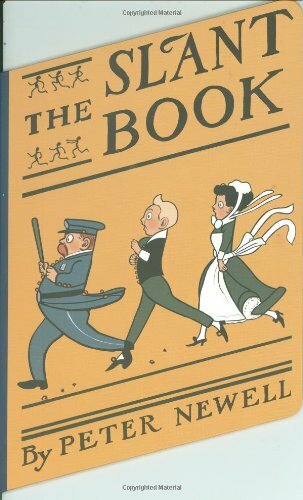 Newell’s farcical take on the scenes of small-town life have an exhausting energy but suffer (here, as in the original edition) from a dowdiness in the colour process that was used.